The development of transfection technologies in choanoflagellates sheds light on ancestral cell scaffolding machinery. Choanoflagellates are closely related to animals, making them a fantastic comparative model to reconstruct the cell biology of the first animals. However, until now, research in choanoflagellates has been limited by the absence of methods for efficient transgene expression. Here, Booth et al. present the rigorous and comprehensive development of a method for efficient DNA delivery and expression in the choanoflagellate Salpingoeca rosetta. The multi-step method is the first report of efficient transgenic transformation in the system. The authors carefully dissect the contribution of each component of the protocol in producing efficient transformation, positing particular technical procedures which could assist in development of transgenics in other emerging cellular model systems. For example, choanoflagellates are encased in a thick mesh of extracellular matrix, which has historically hampered effective delivery of DNA. The authors develop a method for removing much of the ECM mesh without damaging cells, as well as novel recovery conditions, allowing for successful nucleofection and subsequent cell survival. The group goes on to endogenously tag gene products in order to highlight cellular structures in S. rosetta. They present markers of organelles and cytoskeletal elements, uncovering novel actin and tubulin structures, and allowing for visualization of flagellar beating in vivo. Ultimately, choanoflagellates are a powerful experimental system to interrogate the function of gene products known to be important to animal cell biology, in the hopes of reconstructing what the ancestors of animals may have looked like. To this end, Booth et al. endogenously tagged the septin SrSeptin2. 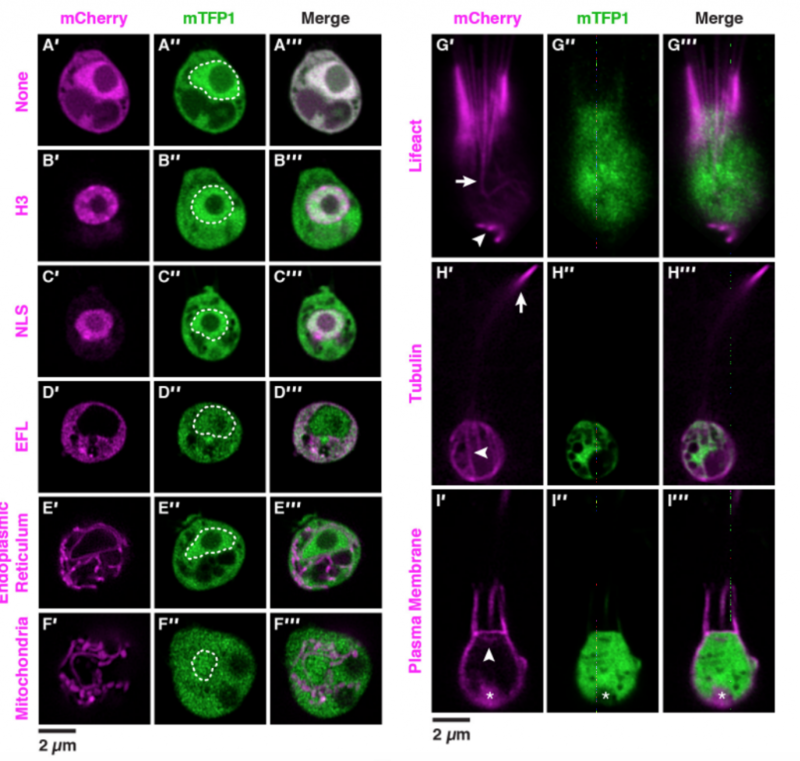 Septins play central roles in cell structure, division, and polarity in animal cells, and SrSeptin2 transcript abundance is markedly increased in the multicellular life stage of the choanoflagellate S. rosetta. Incredibly, the authors found that choanoflagellate septins are localized basolaterally at cell contacts, in similar patterns to polarized epithelial cells, suggesting that spatially restricted septin expression may have evolved before the divergence of choanoflagellates and animals. The paper reports a massive amount of careful and laborious protocol optimization, leading to a major technical advance in the field. 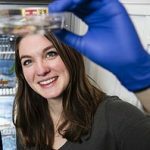 But, it goes beyond tool development to unveil novel choanoflagellate structures and the conservation of core polarity and adhesion molecules between animals and their closest relatives. In the future, scientists may tag any number of genes to compare the expression and localization of the products between choanoflagellates and animal cells. Fluorescent markers expressed from reporter plasmids in the choanoflagellate S. rosetta. Reproduced from Figure 3. of the preprint. What general features of non-model cells might impact transfection protocol optimization? How might researchers modify your protocol to apply it to new species? What gene families would be most informative to tag and visualize in choanoflagellates in order to draw meaningful conclusions about animal evolution?